The Village of Wausa intends to apply for Community Development Block Grant (CDBG) funding for a Downtown Revitalization (DTR) improvement project. Community and business support is very important in the scoring of the grant application and success of the project if funding is awarded by the Nebraska Department of Economic Development. Your assistance through answering the Downtown Business Survey is very important or the grant application. A public hearing on the grant application will be held at the May Village Board meeting. Your attendance and support at the public hearing would be greatly appreciated. The application is due the end of May. The Village will request $30,000 grant funds and will need to provide $10,000 in local matching funds. If successful, the grant will be awarded during the summer of 2016. The Phase I will be the development of a Downtown Redevelopment Plan with the assistance of a professional planning firm selected by the Village. The planning phase will begin in the fall of 2016 and must be completed within nine months. The DTR plan will identify several priority projects which will be the focus of Project Phase II grant application. A local DTR committee has been appointed by the Mayor to provide local input into the planning process. The contact persons for this committee are Jason Seagren 515-577-5355 and Eric Wynia 402-841-1797. In the future if the Village were to receive a Phase II DTR Project award, it will be funded by up to $350,000 CDBG grant funds. DTR projects in other communities have included public infrastructure (streets, sidewalks, water, and sewer) and business facade improvements. A local match of 25% of the total project cost is required which will be approximately $108,000. The source of local match will be determined by the type of project. A building facade project will have the local match provided by the business owner who participates in the program. The Village typically provides the match for public improvements such as streets. Identify some of the strengths of Wausa. How would Wausa benefit from downtown revitalization planning? How would Wausa benefit from projects such as building facade and public infrastructure improvements? Additional information about this project can also be obtained by contacting Lowell Schroeder at the Northeast Nebraska Economic Development at 402-379-1150 Extension 102. 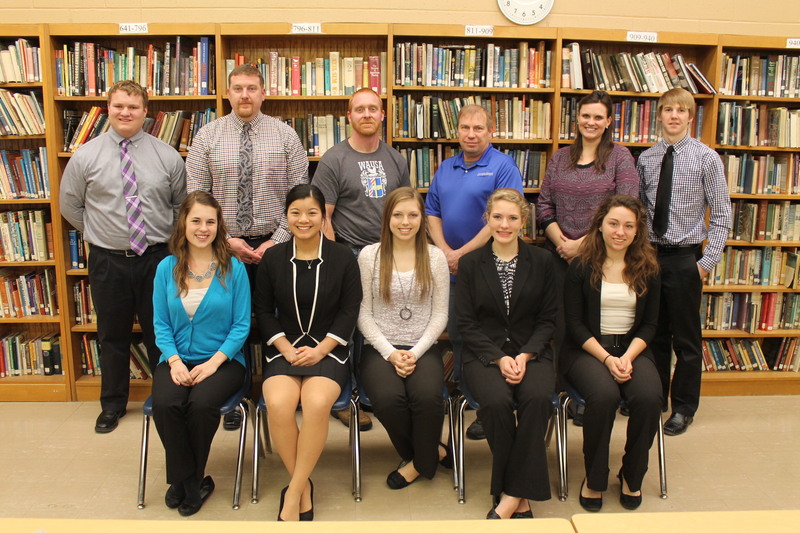 Wausa FBLA officers pose with the Downtown Revitalization committee.